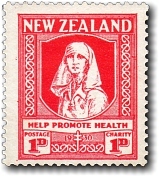 A new design for the 1930 health stamp was planned, but because it could not be completed in time, the previous design from 1929 was retained with the new inscription "help promote health" and a new date. At the Health Department's suggestion, the proceeds of the charity value were donated to Children's Health Camps. The Health Camp Movement in New Zealand started at Turakina new Wanganui in 1919 and with the objective of providing a change of environment and regulated daily routine for children who were in any way run down in health - usually nutrition or minor physical problems. The also provided a three week holiday for children during the 1930s depression. The 1930 health stamp only sold just over 200,000 copies.